In our last NGSS blog, we took a closer look at the Disciplinary Core Ideas (DCIs), the standards’ mechanism for organizing science content. This blog discusses another, more abstract pillar of the NGSS’s three-dimensional learning model, crosscutting concepts (CCCs). 1) Patterns – Observed patterns in nature guide organization and classification and prompt questions about relationships and causes underlying them. 2) Cause and Effect – Events have causes, sometimes simple, sometimes multifaceted. Deciphering causal relationships, and themechanisms by which they are mediated, is a major activity of science and engineering. 3) Scale, Proportion, and Quantity – In considering phenomena, it is critical to recognize what is relevant at different size, time, and energy scales, and to recognize proportional relationships between different quantities as scales change. 4) Systems and System Models – A system is an organized group of related objects or components; models can be used for understanding and predicting the behavior of systems. 5) Energy and Matter – Tracking energy and matter flows, into, out of, and within systems helps one understand their system’s behavior. 6) Structure and Function – The way an object is shaped or structured determines many of its properties and functions. 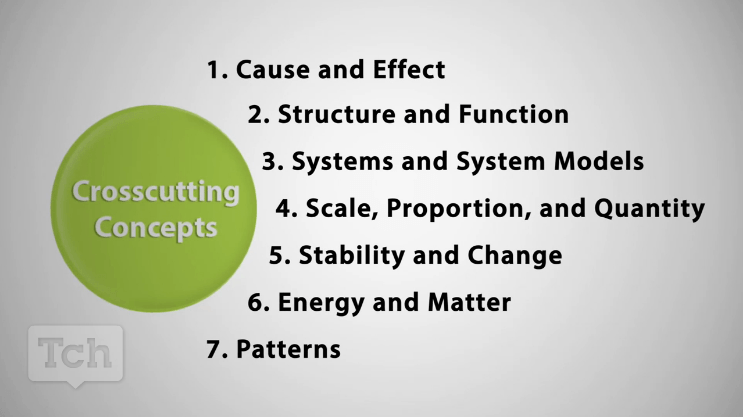 7) Stability and Change – For both designed and natural systems, conditions that affect stability and factors that control rates of change are critical elements to consider and understand. With CCCs, teachers can deliver new content in the context of older material taught successfully, adding continuity to the long-term science curriculum. Legends of Learning Ambassador April T. says, “[t]here is a big push to make sure that our students are becoming comfortable identifying and explaining the SEPs and CCCs that are being presented in our different units and activities.” This push is important, but it comes with challenges. While science curricula traditionally focus on specific content, the NGSS’s “three-dimensional” approach places importance on ideas that are more abstract and can be more tougher for students to learn, and for teachers to teach. Expert chess players think about groups of pieces and the strategic moves they can make, while novices tend to focus on the individual pieces. Like the expert’s mindset, CCCs group pieces of scientific information by broader similarities to fully understand each piece’s importance. Learning science without CCCs is more like the novice perspective, failing to consider how the different scientific principles relate to each other across the broader field of science. The next challenge is actually teaching students. As unfamiliar as teachers may be with CCCs, students probably struggle more with abstract concepts. This makes NGSS pedagogy crucial to success. NGSS Writing Team Leader Cary Sneider has a number of tips for teaching CCCs. He recommends targeting only the CCCs that best apply to the grade being taught. Since NGSS outlines detailed performance expectations for each grade, it is fairly simple to determine which CCCs are appropriate. This “learn by doing” approach is useful because students are best able to understand concepts when they see examples. However, it’s not only students who learn by doing; teachers do, too. The next task is finding out what teaching CCCs looks like in practice. The Research + Practice Collaboratory published a series of worksheets for teachers that “can be used as part of a multi-component assessment tasks—or they can be used in formative assessment discussions in the classroom.” Each worksheet is full of detailed, fill-in-the-blank questions for each of the seven CCCs to apply them to any relevant subject matter. In addition, Community Resources for Science compiled a webpage with videos, presentations, NGSS publications, NSTA webinars, and a number of in-class exercises that cover CCCs as a whole, as well as each specific concept, to help educators teach them. Legends of Learning’s 90 learning objectives are based on the content-based DCIs. The resources mentioned in this blog, and more from our upcoming NGSS white paper (which will be found on our resources page), help teachers bring the three-dimensional NGSS model to their classrooms.